Largest in Asia and one of the world’s 10 largest municipal zoos, the Taipei Zoo or the Muzha Zoo is undoubtedly the best zoological garden in Taiwan. This is one of the most visited family attractions and is at the Section 2 of the Xinguang Road. The fun starts right from the journey to reach here as you might experience the thrill of hiking the hill as it is perched uphill. However, getting to the Taipei zoo is quite simple by catching the MRT Muzha Line until the last Taipei station. There are over 400 animal species, over 10 outdoor and indoor habitats, and wonderful landscapes here. Coming to its indoor exhibits, there are seven in total each of which boasts a unique theme. The most famous celebrity of the zoo – Grandpa Lin Wang as an Asian Elephant survived here until he became 86 and his this additional 20 years of living was called as ‘miracle’ by the experts as no other Asian elephant has lived that far. Although he has died, you can still see him as Lin’s body was stuffed for exhibition in the Education Center. Today, he is honored by being the planet’s largest stuffed Elephant of Asia! Talking about the outdoor exhibits, there are 8 such displays that are split as per the geographical environments adding educational value. A special mention goes to the bird section that is a real exciting sanctuary where more than 1000 birds are easily spotted. A visit to the Taipei Zoo is eagerly recommended for those who really scare to explore the other Asian zoos. This is because the Asian displays are really well exhibited here. Overall, the zoo is the ideal base for the families to explore the different animals of the world, have plenty of fun, cool down in its gardens, and stroll on the wider routes inside as the children play in the dedicated zones here. These displays engulf ‘Formosan’ Animal zone holding the native fauna, Asian tropical rainforest, insect valley, water garden, children’s zoo, a fern garden, desert animals, bird world, Australian animals, African animals, temperate zone animals, and wetland park. As per online voting, the top exhibits are the Children’s Zoo, African Animals, and Formosan Animal Area that houses common species such as Swinhoe’s pheasant, Taiwan macaque, and Formosan sika deer – some species that are seen in Taiwan only. And yes, I also loved the astonishing hippo exhibit where many are found in the ponds, while some in a hanging mode. Really, this scene is just worth a visit in rains. In this category, you can explore the educational center, koala house, penguin house, reptile house, children’s theatre, the conservation corridor, insectarium, cool energy conservation house, special exhibit house, amphibian house, and nocturnal animal house. Among these, do ensure that you see the Insectarium that is normally ignored! Do not act stupid by missing this one as this is the home of many butterfly species seen only on this island. After this, some mandatory visits are the famous Koala House as well as the Penguin House. 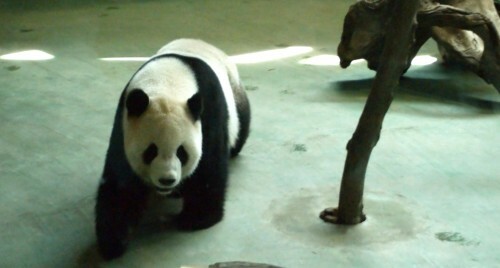 And lastly, look definitely for the two giant pandas that have come here from China and are treated as resident stars! Try to explore the zoo during the rains as it is 100% fun to so under the natural pour that really does not impact negatively here.